Year of Young People 2018: Bradley Booth | LEAP Sports Scotland We celebrate the achievements and stories of young change-makers from within the LGBTI community. 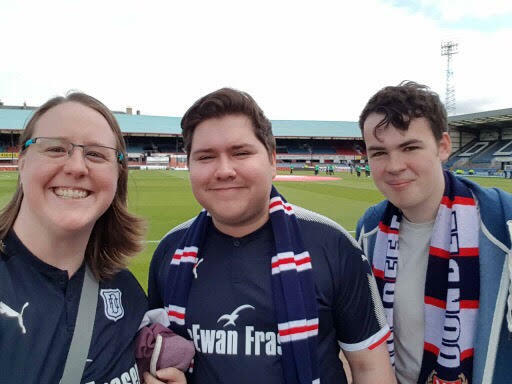 Bradley Booth is a co-founder of the Proud Dees, Dundee FC’s new LGBT fans club, an Italy supporter and has endured some of Dundee FC’s sorer defeats... He has played an instrumental role in building up the LGBTI inclusivity of Dundee FC through the establishment of a fan club, working with the club and their supporters’ association on a number of measures for LGBTI inclusivity and in an especially proud moment for Bradley and his friend and co-founder of the Proud Dees, Michael Craig, seeing the club sign up to the Scottish LGBT Sports Charter. I love Dundee, it's been a part of my life for as long as I can remember, I've supported us at our worst (seriously, going from world class players like Caniggia to watching us getting beat from Stirling Albion in Division 1), I've put my pocket money into the club to save it from 2 different administrations. So, it seemed natural to try and bring two parts of my life together, and set up the Proud Dees with my friend Michael Craig. Something about that tournament had me falling in love with the game, and sport in general. Ever since that world cup I have played and watched football. I've been regularly attending my local team (Dundee FC) since 2006, but I enjoy the game so much that it doesn't really matter the team playing, I'll happily watch. Bradley has since then experienced first-hand how demoralising and alienating an experience it can be for LGBTI fans to witness homophobic language used by fans of your own team at games, as well as the effect this can have on someone still finding their way out of the closet. As we often find at LEAP, when visible indicators of acceptance from your own community are not there, the results can be devastating. I can remember going to matches and hearing homophobic abuse being shouted at players, as well as racism, but from what I can remember the racism was always dealt with (quite rightly) but the homophobic comments were viewed as "just banter" by most fans. As someone that was deep in the closet hearing how friends, and fellow sports fans would treat both the opposition, as well as our own players, by shouting abuse at them for showing any sort of lack of masculinity only increased my desire to stay hidden in the closet. His interest in Dundee FC initially diminished after coming out. But further down the line, he realized how widespread the problem was beyond his own club, as well as learning about the establishment of LGBT fan groups at other clubs. Each of these things sparked a desire to take action on his home turf. I had always heard homophobic comments at sports games, but it was the Gareth Thomas documentary on homophobia in Football that made me realise just how wide spread it was. After researching and finding LGBT supporters clubs all around the country I felt it was something Dundee would benefit from, as not many LGBT fan groups existed in Scotland. Bradley has experienced how empowering it can be for LGBTI fans when a team explicitly recognises and supports LGBTI fans, through publicly supporting groups like the Proud Dees and with leadership among a club making explicit gestures of and strategies for solidarity with the LGBTI community. As more and more LGBTI fans feel comfortable being themselves with their own team, communities merge and this solidarity then becomes more and more a part of ordinary club culture. All with the Proud Dees acting as a beacon for LGBT fans. On the day of our launch the club confirmed it would sign up for the Equality Network's LGBT Sports Charter, and our captain sported the rainbow armband on a televised match vs Rangers. We've already made progress and we hope to continue to. He and the Proud Dees have also responded to questions about why there is a need for LGBTI fan groups, including from other Dundee fans. He replied to point out that groups like the Dees don’t exist to separate fans, but to increase visibility and community for a marginalised section of the fans and wider society, provide autonomous leadership among that group and to help empower LGBTI Dundee fans point to where there are problems surrounding LGBTI acceptance in the game and in the club, based on their own lived experience. Bradley has been pivotal in setting up a club which now makes clear to has had enthusiastic responses from Dundee FC itself and Dundee Supporters Association, as well as adding to a growing community of LGBTI fan clubs appearing across the country and further afield. 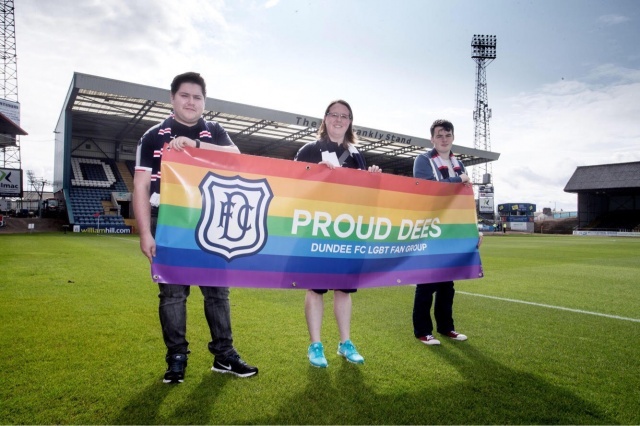 The result is that young LGBT people who may be in similar positions to that of Bradley can now witness visible markers of efforts undertaken by Dundee FC and their wider fanbase to ensure that LGBT fans are made to feel welcomed, valued, respected and included in one of their passions, as well as to know that there’s an inclusive fan club ready to welcome them. This visibility of inclusion and community for LGBTI fans is something which we at LEAP often have community members tell us is vital to them as part of effective inclusion strategies, especially where LGBTI young people are concerned. If we can raise equality issues with the club, and expand the clubs fan base by making it a welcoming club for all, then we will have been successful. 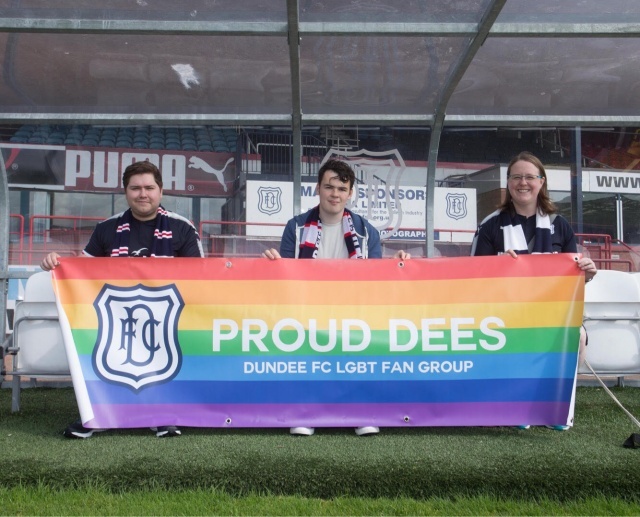 You can find the Proud Dees on Facebook and Twitter, on existing LGBTI fan clubs here, the Scottish LGBT Sports Charter here and resources to support you in setting up a club here. If you’d like us to support you in setting up a fan club, please get in touch at info@leapsports.org . Written on 8th February 2018.